If you’re in the Crescent City and want to easily buy and sell cryptocurrency, chances are you need to find a New Orleans Bitcoin ATM near you. Bitcoin ATMs have popped up all over New Orleans since the cryptocurrency’s popularity gained traction with local merchants as far back as 2014. French Quarter mainstay David’s Antiques led the charge, selling its rare heirlooms in exchange for Bitcoin. In the world of dining, Booty’s Street Food in the Bywater and Cafe Luna Uptown also began accepting Bitcoin. Accepting payment via cryptocurrency is an attractive way for businesses to sidestep credit card fees, which can be as high as two percent. It’s also an excellent way to do business with international customers. If you’re visiting or based in New Orleans, there are plenty of compelling reasons to buy Bitcoin. Whether you’re a first-time buyer or a seasoned investor, find the nearest Pelicoin Bitcoin ATM to buy, sell, or exchange your cryptocurrency holdings for cash. Here’s a handy guide to where you can find Pelicoin ATMs throughout the city. The first stop for many New Orleans visitors is the French Quarter. In between your visits to bars, restaurants, and live shows, stop in to Sam’s Unique Grocery at 129 Royal Street to turn your cash into Bitcoin at a Pelicoin ATM. Bitcoin allows you to make safe, simple, and anonymous transactions, so you can do business with people all over the world. If you’re keen to visit a quirky shop that will transport you back in time, pop by David’s Antiques & Jewelry, where you can spend your Bitcoin without converting it to cash first. David’s specializes in vintage home decor, eccentric jewelry from bygone days, and more. If you need to get your caffeine fix, there’s nowhere more quaint and welcoming than Cafe Luna. In addition to their famous coffee, this cafe stocks gourmet baked goods and also houses a Pelicoin ATM. Conveniently, Cafe Luna also accepts Bitcoin! Nestled in the heart of the Uptown neighborhood at 802 ½ Nashville Avenue, Cafe Luna has been beloved for over a quarter century. The Garden District brims with beautiful architecture and high-end boutiques full of vintage and modern treasures. Enjoy everything this classic New Orleans neighborhood has to offer, from streetcar rides to grand old oak trees. There are coffee shops, bars, and fine dining establishments to please every palate, so be sure to have cash on hand. Cruise by Discount Zone Gas Station at 3434 St. Charles Avenue to convert your crypto to bills, or if you’re planning on a big purchase later, convert cash to crypto at this two-way machine. Central City is known for its Cajun restaurants, art exhibits, and film screenings, many of which celebrate African American. The longstanding landmark Leidenheimer Bakery bakes po-boy loaves, and the golden steeple of St. John The Baptist Church still looms over the neighborhood. But in this neighborhood, old school traditions has met new age technology with a Pelicoin ATM at Super Discount Gas, located at 2727 S. Claiborne Avenue. If you’d like to pay for a meal with cryptocurrency at Booty’s Street Food in the Bywater, Quicky’s Convenience Store houses the closest Pelicoin ATM at 1535 Franklin Avenue. Be sure to take a stroll in Crescent City Park after your meal, and walk all the way out to the river. Peruse the many art galleries in the neighborhood, and if you’re feeling adventurous, rent out a Blue Bike and pedal back into town at the end of your visit. Just a short drive from New Orleans across Lake Pontchartrain lies the city of Mandeville. This quaint suburb is a bustling community of its own and it has started to become more accepting of Bitcoin and other cryptocurrencies. Stop by the Discount Zone gas station on LA-22 and buy Bitcoin, Litecoin, or Ethereum from our Pelicoin ATM. To the west of New Orleans sits the town of Metairie. Metairie is home to two Pelicoin ATMs – one on North Causeway Blvd. and another on West Metairie Ave. These ATMs are close to the city, so feel free to grab some crypto on your way home from Blockchain or Bitcoin meetups in New Orleans. 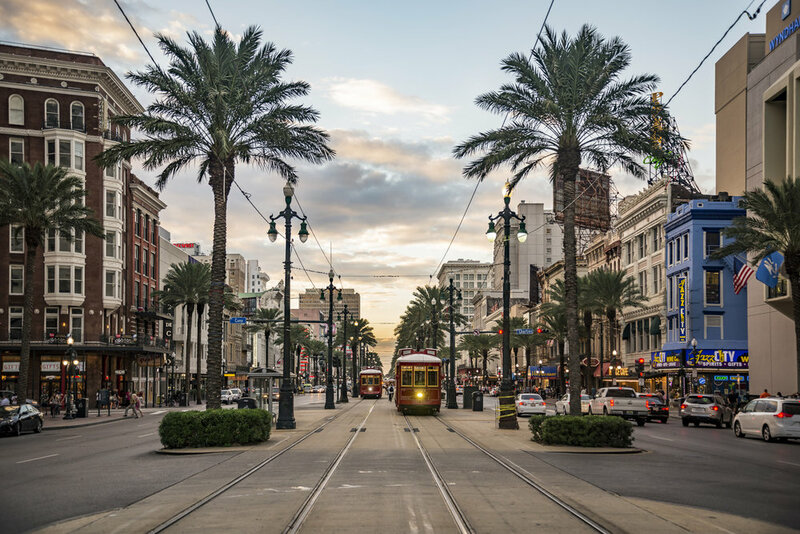 Cryptocurrency is thriving in New Orleans, which is now home to the annual Crypto Current Conference, hosted in the New Orleans Jazz Market. The city boasts a wide variety of cryptocurrency and blockchain MeetUp groups, and there are tons of room for newcomers to get involved. New merchants are accepting Bitcoin every day, and investors are saying the digital coin has nowhere to go but up. Visit one of our many New Orleans Bitcoin ATM locations near you today.